Starting this month, some kids in San Francisco can ride the bus for free. The new program, called Free Muni for Youth, aims to make life a little easier for the city’s low- and moderate-income families. The city estimates that 40,000 young people qualify for the program. “It started in a small room, just a couple pieces of pizza and people are like, 'We should make free Muni for young people,'” says Nick Persky. He’s a 17-year-old junior at Lick-Wilmerding High School and the vice chair of the San Francisco Youth Commission, a group of 17 young people who advise the mayor on youth issues. Persky wasn’t around when the idea for free Muni for young people first came about – he said it dates back about a decade – but he’s proud see it put into action. Part of the reason kids need a free ride is that years of budget cuts have all but eliminated yellow bus service in San Francisco. 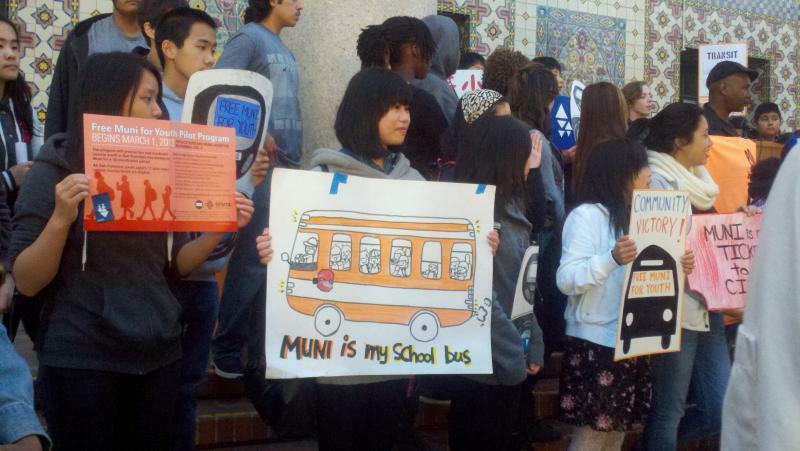 For a lot of students, that means Muni is the only way for them to get to school. Paul Monge-Rodriguez, a legislative aide for the San Francisco Youth Commission, says people shouldn’t think of it as a handout. “It’s almost like a reallocation, still investing in the same types of services, but just through a different source of funding,” he explains. The San Francisco Municipal Transportation Agency board of directors approved a pilot program almost a year ago, but the plan was contingent upon a $4 million grant from the Metropolitan Transportation Commission, the regional transit board. In July, the MTC denied the grant. But in the fall, a new grant surfaced and SFMTA director Ed Reiskin recommended that $1.6 million of it be used to fund a 16-month trial. Last week, the diverse coalition that made Free Muni for Youth a reality held a press conference to celebrate its official launch. Everyone involved, from young people, to city Supervisor David Campos, to Reiskin, was quick to praise the others for their continued cooperation. Reiskin told the students, “You guys are the ones that made this happen,” noting that this was the best grassroots initiative he had ever seen. Still, Reiskin says funding the program was a difficult decision, because Muni’s infrastructure has a lot of existing problems and it needs all the money it can get. But ultimately, he sided with the young people of the city. It was an emotional day for many of the people involved. Claudia Gonzalez, a mother of two from Potrero Hill, spoke through an interpreter about her experience. Gonzalez said she owes a big thanks to POWER, an advocacy group that played an important role in organizing the campaign for Free Youth for Muni. Now, her two kids (ages 11 and 13), will get a free ride to school. Throughout the day, though, everyone agreed the majority of the praise should go to the youth who organized and fought on their own behalf for the right to free public transportation. At the press conference, SF Unified School District Superintendent Richard A. Carranza summed up a popular sentiment about the students’ instrumental role. Isabel Angell is KALW's transportation reporter. You can find her work and more stories at transportationnation.org.